In the absence of information, floor covering consumers, and all consumers for that matter, have nothing to base their purchasing decisions on except price. The result is that price becomes the only differentiator. 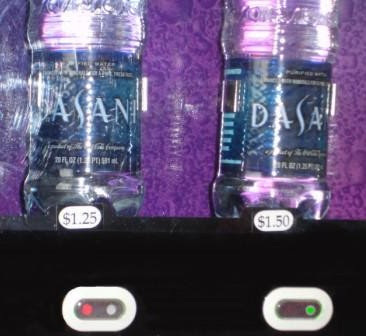 On a recent trip I noticed a vending machine displaying two, apparently identical, bottles of water. One cost $1.25 and the other $1.50. The $1.25 item was sold out while the $1.50 inventory was still available. A commodity product, by definition, is one that has no differentiation from competitive products in the market place and therefore is sold on price alone. Try to increase the price above market without differentiation and the result is what you see in this picture. Very simply, the goal of branding is to communicate product differentiation that creates profit opportunity. A classic example of successful branding is a non-descript solid color golf shirt that may cost $25 but with a little polo pony and rider on it the price jumps to $85. Higher prices can be justified when the consumer perceives that it comes with additional features or benefits they want. The other morning I had breakfast with the international advertising director for a world renowned beer manufacturer. Off the record, he explained that beer is a commodity and that even the most dedicated brand beer drinker cannot consistently pick their favorite beer in blind taste tests. That is why most beer companies create “lifestyle” ads to differentiate their product in the consumer’s mind. The flooring industry’s experience with brands has been mixed. Brands linked to well known designers or celebrities, without additional performance differentiation, have generally not fared well. Nylon carpet linked to performance advantages, such as Stainmaster™ and Wear-Dated™, have benefited from that differentiation and justified higher prices. An interesting development is taking place that hopes to differentiate wool carpet fiber in a similar way. Although there are differences in wool fiber, the consumer today does not know this. They believe that the designation “wool carpet” tells the whole story. The Wool Marketing Enterprise has plans to change that. Through the Just Shorn™ brand they will differentiate and communicate the benefits of their fiber which is certified to contain only the best quality, ecologically grown, strong wool from New Zealand. The marketing program will contain a strong message to differentiate Just Shorn™ from the rest of the wool herd. I am currently advising Just Shorn™ to do that and I believe this branding opportunity is overdue. Do I think the branding differentiation will help luxury and other discriminating buyers identify better quality carpets that meet their expectations? I think it will and so does CCA Global Partners as they plan to launch the Just Shorn™ program through their International Design Guild ("IDG") members before Surfaces 2010 in Las Vegas. Communicating additional benefits through strong brands creates profit opportunity while assuring the customer that they will receive what they want and expect. Good luck to Just Shorn™ and its launch partners, IDG and the wool carpet manufacturers who are participating in this new branding opportunity. A few years ago while discussing products and their difference with Carpet One retailers, Paul Johnson, who owns several Carpet One stores in Oklahoma, told me, "Give me a good product with a reasonable price and a great story and I can make a profit." He understood how important differentiating products can be for the retailer and it's more important now than ever. I'd love to receive your comments and hear about your experiences.